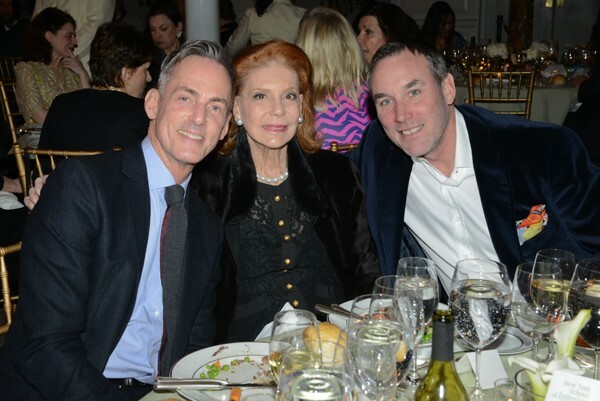 On Monday, March 10, 2014, the design industry and supporters of NYSID attended the College's annual gala at 583 Park Avenue, New York City. 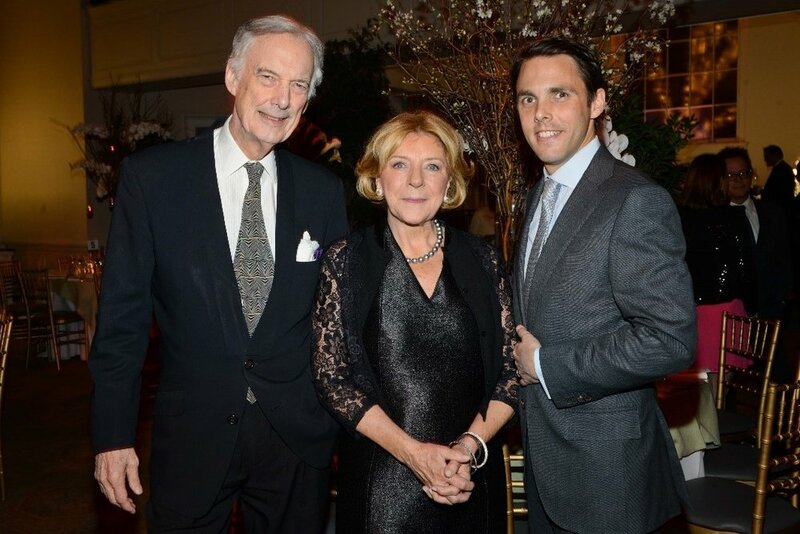 More than 180 guests came together to honor interior designer and NYSID alumna Mariette Himes Gomez, who received the Albert Hadley Lifetime Achievement Award, and landscape architect Charles Jencks, who was presented with the Thomas N. Armstrong III Award in Landscape Design. Gomez is a noted residential interior designer whose always fresh, understated spaces exemplify elegance and gracious living. She was cited by Architectural Digest as one of the "world's greatest designers of all time." Jencks is an award-winning landscape architect, author, and co-founder of Maggie’s Centres, cancer care centers designed by architects such as Frank Gehry, Rem Koolhaas, Steven Holl, and Zaha Hadid. The exhibition, Maggie’s Centres: A Blueprint for Cancer Care, is currently on view at the NYSID Gallery through April 25, 2014. The spectacular venue, 583 Park Avenue, sparkled with a light installation, designed and donated by BlackBody, including a two-story cascade of tiny OLED lights behind the stage. Stunning floral table arrangements, including tree branches with large white orchids, calla lilies, and hydrangea were donated by Ariston Weddings & Events. Notable guests attending the gala included Bunty Armstrong, Michael Bagley, Leslie Banker, Charlotte Barnes, Nancy Boszhardt, Orli Ben-Dor, Peter Bentel, Deborah Berke, Doris Leslie Blau, Michael Boodro, Nancy Boszhardt, Carolyn Brody, Mario Buatta, Allison Caccoma, David Easton, Carolyn Englefield, Mark Ferguson, Diane Fisher, Ross J. Francis, Mark Gilbertson, Alexander Gorlin, Jared du Pont Goss, Susan Zises Green, Janet and Elliot Greene, Eileen Guggenheim, Duane Hampton, David Hottenroth, Christopher Hyland, Alexander Jakowec, James Joseph, Annie Kelly, Jodie King, David Kleinberg, Ellen Kravet, Thomas Kligerman, Ed Ku, Ruth Lynford, Brian McCarthy, Renee Meyers, Dennis Miller, Susan Nagle, Sandra Nunnerley, Stephanie Odegard, Mary Ellen and Richard Oldenburg, Cynthia H. Polsky, Shax Riegler, John Rosselli, Robert Ruffino, Betsey and William Ruprecht, Tom Samet, Ellen Scarborough, David Scott, Oscar Shamamian, Harold Simmons, Clinton Smith, Matthew Patrick Smyth, Patricia and Michael Sovern, Doretta Sperduto, Tim Street-Porter, Robert and Lynn Wankel, Claire Watson, Ashley Whittaker, Bunny Williams, and Medhi Youcef. Click here to see more photos from the event. Gomez was presented the Albert Hadley Lifetime Achievement Award by Hampton, who cited Gomez’ “extraordinary accomplishments as a designer of interiors, furniture and furnishings.” Hampton added, “Mariette, you have given sublime spaces to your friends and clients, you have advanced our understanding of what interior design is and contributes to our lives, and you are an inspiration to your peers and the rising generation of designers.” In accepting the award in Albert Hadley’s name in the presence of so many who had worked with him, Gomez spoke movingly of Albert Hadley: Drawings and the Design Process, a book NYSID published in 2004 with a profile by Mark Hampton, with remarks by Mario Buatta, David Anthony Easton, Mariette Himes Gomez, Thomas Jayne, and Bunny Williams. Jencks was presented the Thomas N. Armstrong III Award in Landscape Design by Armory Armstrong, daughter of the late Thomas N. Armstrong, who spoke on behalf of her family. “Charles Jencks takes on the issues in the contemporary dialogue of art, culture and society, including land reclamation and design to improve health and provide hope,” said Armstrong, “We also recognize Charles Jencks as a powerful advocate for the power of design in addressing these issues.” Both honorees were presented with elegant crystal vases, which were donated by Lalique. Thanks to the generosity of NYSID trustees Jill Dienst, Anne Korman and Libby Cameron and Donghia, NYSID student leaders and winners of the 2013-14 Donghia Scholarship attended the dinner.